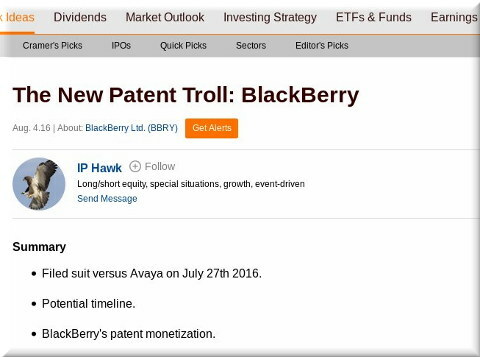 BlackBerry is gradually becoming more of a patent troll. We warned about this several years ago and now it’s officially happening. We wrote about this earlier in the day yesterday and shortly afterwards we found the article “The New Patent Troll: BlackBerry” (via The IP Hawk, who actually wrote it). What’s nice to see here is that our prediction was correct. It’s sad to see once-practicing companies resorting to these tactics because their sales or market share are minuscule and products not compelling/competitive anymore. For that reason, when Mr. Fischer suggests that the company can unlock IP licensing revenues—of company patents– ranging from $290 million to $570 million, this blogger needs to ask: What is there in the company’s patent portfolio (separate apart from licensing of the character rights), that supports such an amount? Indeed, how is the value of this estimate range reached?